In today’s complex work environment, teams are faced with new challenges yet saddled with skills meant for an earlier era. GPD has pioneered research-based methods to transform teamwork backed by fifteen years of practical industrial deployment. 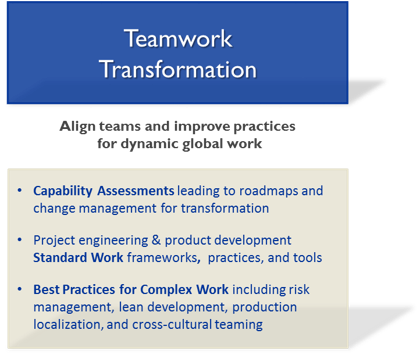 GPD begins by assessing the value of improved team behaviors, practices, and tools to meet the reality of complex project work. Together we focus on smart, fast, and sustainable ways to increase readiness, reduce risk, and improve performance. A roadmap for transformation is established and communicated across the organization. Based on this clear roadmap, improvement propagates where and when it matters most. Behaviors and processes are transformed in an engaging campaign: clarified standard work, project-by-project deployment, best practices training, and reinforcement by analysis and learning.